So I was primed and ready to experience Fishes ‘n Loaves: Heaven Sent, “a comedy of biblical proportions,” as the tagline described it. My wife thought it sounded cute, and my daughter was along for the ride. But it wasn’t long before we started giving each other sidelong glances. Funny how you don’t give casting a second thought until it seems wrong. And from the minute that Patrick Muldoon stood in front of a sparsely populated but really impressive church and delivered his sermon, I wasn’t believing him as a minister. He had the vibe of a business executive leading a team-building exercise, not someone who felt it his calling to tend to God’s flock. Dina Meyer also seemed far from what we think of when we think of preacher’s wives—a little too glam, a little too worldly, maybe. Their children were fine, though we all laughed that the family’s refrigerator is covered with alphabet magnets and the kids are in their teens. But details like that make a difference, and we had a hard time swallowing the “reality” that Fishes ‘n Loaves was serving. Stiff lines of dialogue didn’t help, nor did situational lines that seemed totally unbelievable. I mean, what teenage guy, upon meeting a teenage girl with his family standing right there next to him, would gush, “Gee, you’re pretty”? So here’s where we’re at: Pastor Randy is told that they’re closing his parish—though the building is huge and in pristine condition, so there’s obviously money—and they want him to go to a tiny town in Arizona. His wife, meanwhile, wants him to work for her brother at his pizza place (something else I’m not buying, given the casting) and give up this preaching stuff. Really? One minute Pastor Randy is trying to decide how to tell his family they’re moving, and the next minute he’s mopping the floor of the pizza joint and looking like a mope. I just wasn’t believing his crisis of faith or the way they dealt with decisions in their relationship—at least the way that it was presented here. Did he really need a heavy-handed push from a homeless man named (wait for it) DeAngelis (Michael Emery), who basically explains to him the cliché that when God closes one door another one opens, or that God wants him to go to Arizona? No, but he (and we) get it anyway, and it adds an unnecessary layer of hokiness that even the normally ebullient Bruce Davison, as Pastor Ezekiel, can’t penetrate once the film relocates to its primarily rural setting. But really, it all keeps coming back to casting. Even in Eufala, the assortment of characters lacks the charm and presence to make this city fish feel enough out of water to where it flops and squirms the way it needs to in order to make for successful comedy. Same with the hackneyed “talent auditions” that pop up in way too many movies. 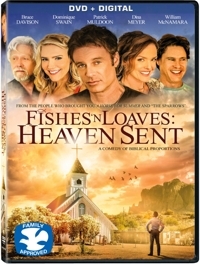 Bottom line: for a comedy, Fishes ‘n Loaves: Heaven Sent just isn’t that funny. What’s more, it falls short of being inspirational because the film’s trajectory is an overly simplistic line from Point A to Point B. (“You’ve taught us city folk the true meaning of how to love one another”). Even a similarly uncomplicated film like Miracles from Heaven does a better job of inspiring because of nuance, better writing, and (here’s that word again) casting.